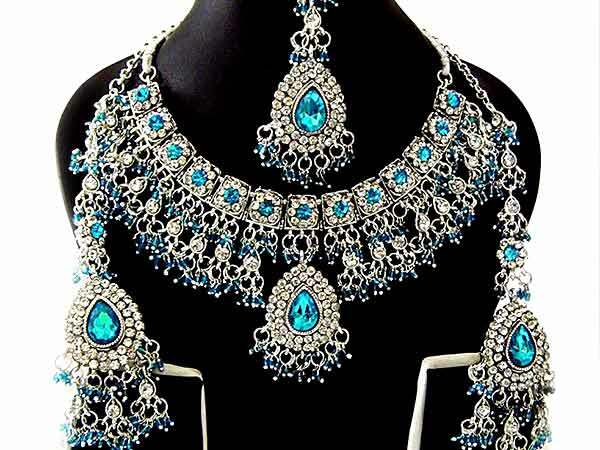 An Indian bride should look traditional at her wedding and modern at the events leading up to the wedding. The modern outfit you choose for your pre-wedding events can have an indo-western look that incorporates Indian fabrics and embroideries in tandem with western cuts. For your traditional or moden look, you can try to wear a combination of two to three colors. If you like red, throw in complementary colors such as bronze and rust. Other colors that look good together are pink and orange. The dupatta can be placed in a unique manner and should have beads hanging from the ends to make it stand out. The dupatta may be draped behind you and should not cover all of your outfit. To look your best, make sure you have a bag that stands out, and matching shoes and jewelry. You need will accessory pieces that will make you look prominent. If you are favor a more simple style, create a clean, streamlined and uncluttered look, but make it different by changing a few things in your outfit. For instance, you can tone down the embroidery on the lehenga and change the neckline so it just not just round. The neckline can be a princess neckline. You can also add a train to your lehenga that can be removed for dancing after the wedding ceremony. If you have the opportunity to go to India for your bridal shopping, you should. You will find better deals and prices in India. But if you do not have the chance, or are planning a wedding on a within a short period of time, then you will have to buy your bridal outfits in the U.S. One good thng is that, it is easier to have your bridal outfits customized and tailored to your liking when you are working with a designer in the U.S.